Facing a Food Crisis – Are you ready for what’s around the corner? Along with many of our readers, our family is preparing for some challenging times to come. Almost anyone anywhere can grow some vegetables, herbs, and fruit. This is a great place to start on a quest to provide more for yourself and rely less on outside sources of food. It’s still possible to plant some cold season veggies in many areas–see our fall and winter veggie gardening info sheet for suggestions. Fall is definitely a good time to prepare a garden plot for next year. And winter can be the perfect season to study, learn, and order seeds in preparation for spring planting. Why is it so important to raise our own food? Aside from shortages and high prices, there are other reasons it’s crucial that we take control over what we eat. We’ve talked about GMO foods before, and at the time of this posting, a must-see movie is available for free viewing. You won’t want to miss Genetic Roulette: The Gamble of Our Lives. From rabbits and laying hens to dairy and beef cattle, there are food-producing animals for everything from small backyards to huge ranches. That’s a good thing, because drought-caused grain shortages are filtering down to supplies of meat, eggs, and dairy products. Extreme drought this summer meant higher prices to feed dairy cows, and now the U.S. faces the smallest dairy herd in almost a decade. That means higher milk prices, and not just for the kind you drink. Feed issues are causing similar shortages and price hikes in factory and small-farm meat, poultry, and egg production. Now is the time to be thinking about raising some meat, poultry, eggs, or dairy. Not only will it help with supply challenges, but it’s a great feeling to know that you can provide a complete meal with protein sources to go along with what you raise in the garden. Think about what will work for you and learn all about it! Is Fish Farming for You? And don’t forget to evaluate your needs for livestock protection! This week we bought several boxes of fruit from a local orchard. 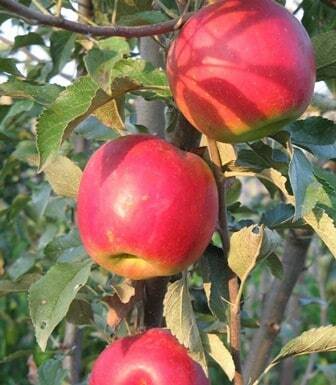 Our own young fruit trees won’t meet our demands anytime soon, but there are a number of fruit orchards in our region. 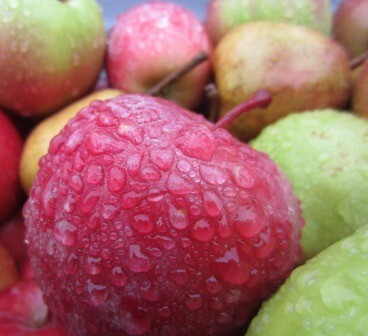 We bought a variety of apples and pears for fresh eating and for preserving. Earlier in the season, peaches and cherries were available too. By buying quantities of fruit from these orchards, we’re contributing to the local economy while stocking up our family’s supply of fruit for the coming year. Plus, it was a fun outing with friends and family members. We’ll be canning some of the fruit together, too! 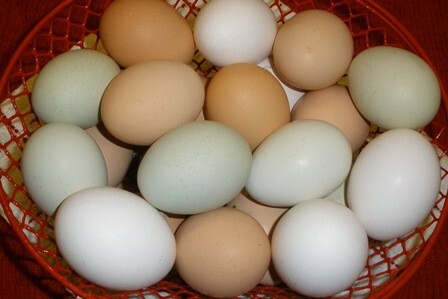 Many communities have sources of locally raised produce, eggs, meat, and poultry. Product sales regulations and permit requirements exist on city, county, state, province, and federal levels. To learn about requirements in your area, consult your local extension office or department(s) of health, agriculture, or food safety. How to find local foods? Look for a local food farm guide at your chamber of commerce or library. Visit local farmers markets or contact their managers during the off season for names of local producers. Check local newspaper classifieds and online classifieds such as Craigslist. Do an Internet search for the food you’re looking for plus the name of your city, county, or state. Buy fresh” and “buy local” are good search terms. Visit local butchers and small produce markets to purchase local products or get names of producers of products. Inquire at your county extension office or other agricultural support agency. Look for a fresh food co-op in your area. See if your area is one of many with a year-round online fresh market. In the U.S., check the USDA Food Compass Map. Availability of various types of meat and the corresponding sales regulations vary from area to area. For example, here in Washington State, pork to be sold by the cut must be USDA inspected and specially handled. The packages in the photo at the right are labeled “not for sale” because the meat is from a whole-carcass purchase and was not processed for retail sale. For United States individual state department of agriculture offices, click here. Grass fed meat requires slower cooking at a lower temp than grain fed. Here’s some basic info and a simple chart by cookbook author Shannon Hayes. What happens when a food distribution network breaks down? 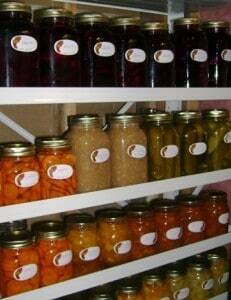 Storing and Preserving Foods Many of us have seen what happens. We’ve seen it in small scale after an unexpected snowstorm or local flooding. And now, in the wake of Hurricane, we see it on a greater magnitude. Anyone who remembers any huge catastrophe knows how life as we know it can change in a matter of minutes. Disastrous weather is one of many events that could make it very difficult to find food and other supplies for our families. We actually had the economy and current events more in mind, but in general we just felt it important that people be prepared for anything. If you’re wondering why we encourage people to have some food and water stored up, read Distribution Disruption by blogger Nicola Twilley. As you read and view the photos, think in terms of anything that could disrupt your own supply chain. 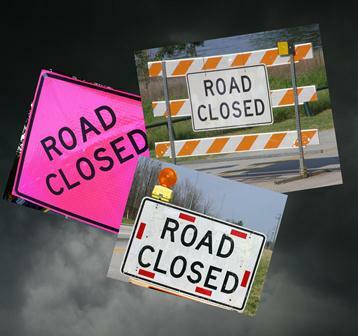 Catastrophic or even just unusual weather, civil unrest, fuel shortage, financial collapse. Add to that personal challenges like job loss, serious illness, unexpected large expenses. While it’s possible that evacuation will take you far from your stash at home, statistics show that it’s much more likely that you will be able to hunker down in your house and eat what you’ve stored when you can’t purchase supplies, cooking with alternative fuel sources when the utilities are down. With Hurricane Sandy’s effects still very fresh on our minds, many of us are aware that we could be immersed in an emergency situation at any time. Personally we’re not preparing for anything specific, like an EMP situation or a zombie attack, but we like to be generally prepared for most anything. As you know if you’re following our series “Beating Food Challenges,” we are expecting to encounter food shortages and high prices in the coming years. So we’re getting ready, and we hope you are too. It’s far better to be prepared and encounter no challenges than to be caught without food and supplies when you really need them. Two keys to emergency stash food choices are to store foods your family already enjoys and to make sure you have ways to prepare the food. And don’t forget water, that essential ingredient that all humans, pets, and livestock require. If your well or tap goes dry, you’ll need water for drinking and food preparation. It’s also helpful to have water on hand for flushing toilets, cleaning, laundry, and other household uses. Our progress towards a sustainable self-sufficient lifestyle centers around producing much of our own food. But storing food raised elsewhere is definitely a part of our plan. For one, we enjoy some foods we’ll never be able to grow. Secondly, our farm is still in its growing years and we don’t yet produce everything we’d like to. So we use several methods to stock up our food storage pantry. We preserve whatever excess we have from the summer growing season. After enjoying fresh produce and sharing some with others, we usually have some fruit, veggies, meat and poultry to dehydrate and can for long term storage. We also freeze food, but since our freezers require electricity that could become unavailable, we don’t rely on them for the bulk of our stored food. We purchase bulk meat, large bags of dry staples, tropical spices, and packaged goods. We routinely buy extra packaged food, but once in a while we make a special effort to fortify our emergency food storage program. Spices will lose their potency over time, but since we can’t grow them they will still be appreciated. While some of our meat and poultry is already frozen, in the event of a serious power loss we could use our alternate-fuel stoves and pressure canners to get the meat into jars fairly quickly. We think beyond food itself to include food-related items. We try to expand the foods themselves to include peripheral needs. Cold and room temperature food can get boring, so a way to heat it can be a huge plus. And if power is unavailable or scarce during the prime harvest season, we want to have a way to preserve our produce. Matches, propane, kerosene, extra equipment, supplies, packaging, and containers for dehydrating, freezing, and canning. Garden seeds (even if you save seeds each year, it can’t hurt to have a stash of extras), feed/feed seeds for the livestock that produces your meat and eggs. Our first year in this four-season climate, we discovered that our barn/garage gets freezing cold in the winter. One shattered bottle made us wake up and smell the apple cider vinegar! During the summer, the barn gets too hot for some foods. So our ideal food storage system includes a cool root cellar, an insulated utility closet in the barn, and a closet in an indoor room that’s kept at a low level room temp. What do you need in order to start or augment your food storage plan? There’s a solution for your food storage challenges, too! Here’s where our friends in the Internet community come in. Thanks to the Internet and blogosphere, there are tons of excellent resources on storing food, water, and other household supplies in various situations and configurations. Again, the Internet, libraries, and bookstores are full of excellent resources, ideas, and recipes for food preservation. But one of the best ways to learn to preserve food is to join a friend who knows how or take a hands-on class where you can “learn by doing” alongside someone who knows the ropes. Besides, it’s much more fun and efficient to can with a friend than all alone. We encourage you to pay special attention to food safety. Your stored food will do you no good if it spoils or makes your family sick. The main food preservation safety rule we live by is to use a pressure canner (not a pressure cooker, not a water bath canner) for all low-acid foods including meats and vegetables. This includes high-acid fruits that are canned with low-acid herbs or vegetables. This is for your own health and safety and that of your family. Food poisoning and botulism are never fun and they can have disastrous results. Be aware that over the years, plants are continuously adapted for resistance and resilience in the garden, and many products that were originally high in acid are no longer high in acid. This is especially true with hybrid tomatoes. Even though our great-grandmothers canned something in a water bath canner, it may not be safe today. Knowing your varieties makes good sense. To ensure food safety, we rely heavily on information based on scientific research, usually from universities or university extension offices. Got more favorites? Please share them in the comments section! We’ve been talking about ways to provide food for your family if the going gets tough. Two more ways to add nutritious foods to your meals and snacks are sprouting and foraging. Both are fairly easy to learn, requiring little in the way of equipment. This is a great way to grow some nutrient-dense fresh food right in your own kitchen. It can be done all year round, but many people find sprouts especially welcome during the winter when fresh greens are not readily available. If for any reason fresh produce is hard to come by, sprouting could be a valuable part of your food preparation. Sprouted greens are also nutritious supplements for livestock, especially during the months when there’s little forage available. As an added bonus, eggs will benefit from the extra vitamins when hens gobble down a snack of sprouts. 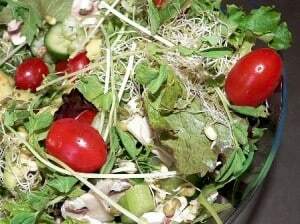 The sprouting process increases the nutritional value of the seed itself. So a radish sprout has more vitamins than a radish seed. A bean or lentil sprout adds extra nutrients not provided by unsprouted legumes. We have found that sprouted wheat, when ground, even boosts the leavening of whole grain bread. Be forewarned though, that sprouts used in baked goods can shrivel up to give the appearance of unappetizing little hairs in your food. We recommend grinding sprouts before putting them into a batter or dough. Most untreated legumes, seeds, or whole grains you buy for cooking will sprout well. Alfalfa, radish, mung bean, and other seeds for sprouting can be purchased in grocery store bulk food aisles, health food stores and nutrition centers. They’re also available from Amazon, Wheat Grass Kits, and of course The Sprout People. Sprouting is fairly simple and requires little in the way of equipment. While manufactured sprouters are available, many people use colanders or glass canning jars. Anything will work as long as it allows for the basic process of repeated rinsing and draining while the seeds are sprouting. Containers such as colanders that drain through the bottom can be set in a pan or sink. Canning jar tops may be covered with cheesecloth or circles cut from plastic needlepoint canvas, secured by a canning jar ring. Manufactured caps are available for wide mouth canning jars. Upended jars may need a rack of some kind to hold them in place over a dish or tray that will collect the drained water. Seeds, grains, or legumes are rinsed and soaked in water, then drained and placed in the sprouting container. The seeds and sprouts should be rinsed and drained twice a day till they reach the size you’d like. The time will vary depending on the type of seed and the temperature of your kitchen, but most sprouts take 2-4 days to grow. For the last 1-2 days, the sprouts will green up if the container is exposed to some light. A complete guide to sprouting is found at the website of The Sprout People. This great site also has a variety of sprouting setups and lots of supplies. Sprouting Edible Seeds is a basic primer written by Amy at Homestead Revival. And here’s a helpful Soaking and Sprouting Chart from Prepper Chicks. Many families routinely forage on their own property or in other areas to add to their food supply. You may have fond memories of berry picking or gathering mushrooms in years gone by. With an investment of time, you could potentially come home with gallons of produce to preserve. If your backyard consists of a well-groomed lawn and immaculate flower beds, there may not be much to eat there. But you might be surprised to learn how many edible plants grow in naturalized areas. Even the common dandelion and its neighbor purslane are enjoyed by many. In addition to what you may find growing wild, some farm and orchard owners are happy to have people come in and glean, gathering up what is left after the harvest. Beware of foraging in areas that have been treated with pesticides or on roadsides fanned by the exhaust of passing vehicles. Other than that, edible native growth should be safe to eat. But not all vegetation is edible. It’s important to learn which plants are toxic so you can steer clear of them. 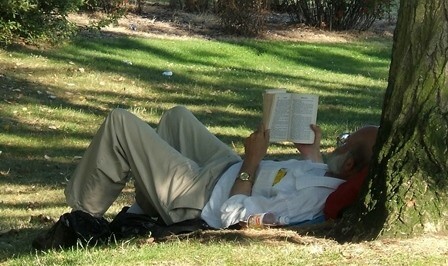 That’s where a great book with color photos comes in very handy as you learn to identify edibles around your environs. A Field Guide to Edible Wild Plants: Eastern and Central North America by Lee Allen Peterson and Roger Tory Peterson. It’s too bad they didn’t write an edition for the western side of the continent, but a number of the plants in this book also grow elsewhere. Wildman Steve Brill has quite a website of foraging info. Many think of him as the guru of foraging, and he’s happy to share what he knows on his site. He goes far beyond the backyard in his explorations for edibles! Laurie at Common Sense Homesteading shares a lot of foraging info and describes a different plant each week at the Weekly Weeder. Lamb’s Quarters, a plant many of us have seen growing wild, is featured in When Life Gives You Weeds, Eat Em’ by Jill at The Prairie Homestead. The 3 Foragers is a blog dedicated to foraging and wild edibles. 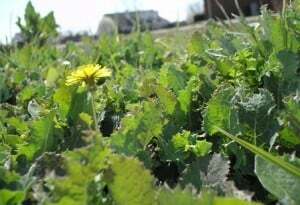 And we’ll end with Edible Weeds: Weed Them and Eat! by Ellen Sandbeck at Mother Earth News. As we wind up our “Beating Food Challenges” series, we’re amazed at the new roadblocks that have arisen just since the first post. Yes, challenges in the food supply chain. The most obvious were caused by Hurricane Sandy’s devastation on the U.S. east coast. Sadly, a number of lives were lost during the treacherous storm. Many people were injured, and others became ill in the following weeks. Our hearts have been touched by news reports and videos. 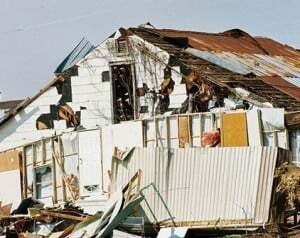 Additionally, countless homes and other buildings were destroyed. But to add to the distress in the area, grocery stores and food warehouses were also damaged. Roads and bridges were washed out, causing shipping delays. Challenges in the food supply chain. And then there are world events that threaten to limit international exports and imports. Severe weather around the world. Wars, uprisings, financial collapse. We hope you’re finding ways to expand your own food source, storage, and production options. Our family has sure been giving some extra attention to those aspects in the past weeks. Bartering, or swapping goods and services, was once a very common practice among neighbors and community members. It kind of fell out of use in many areas due to the availability and affordability of necessary items and services. But recently, bartering has become popular and even trendy in some places. We think it’s a great idea, and we think it will literally be a lifesaver in the coming years. We encourage you to take some time to evaluate the products and services you can use for bartering. This may include things you produce in your home or on your farm, extra supplies or equipment you can part with, and services you can provide for others. Then think of some of the things you’d like to receive. Start looking around your neighborhood and your greater community. Look at advertisements, too; you never know when someone might take an item or service in lieu of cash. Who might need what you have? While an older friend or relative may be your best source of tips for bartering, here are some online resources we’ve found. Some have lists of suggested bartering items. See what ideas you can adapt in your own community! No matter how much you already know, there’s room to expand your knowledge and your skill set. Besides, science tells us that perpetual learning will keep our brains functioning well in old age. 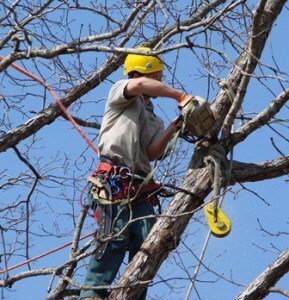 We happen to enjoy learning, and always seem to be researching the next new skill or project. And we highly recommend the practice! Whether you’re improving your abilities in an existing field of expertise or learning something totally new, you’re increasing your chance of smooth sailing when times get tough. Learn some new ways to raise, preserve, or store food. Learn some new skills (or hone some old ones) that you could use for barter. Cruise the Internet for new ideas and info. Become familiar with your local library and used book stores. Watch for book swaps and freebies. Keep your eyes open for classes and workshops where you can learn from someone who already knows what you want to learn. We’ve reviewed a number of helpful publications here at Rural Living Today. We read Extension publications as well as articles and blogs at GRIT, Mother Earth News, Backwoods Home, and Hobby Farms. There are some great books about gardening, livestock, food preservation, and other homesteading topics. Lots of bloggers post ideas and tutorials for doing all sorts of things. Some of our favorite blogs are listed on our Resources page.